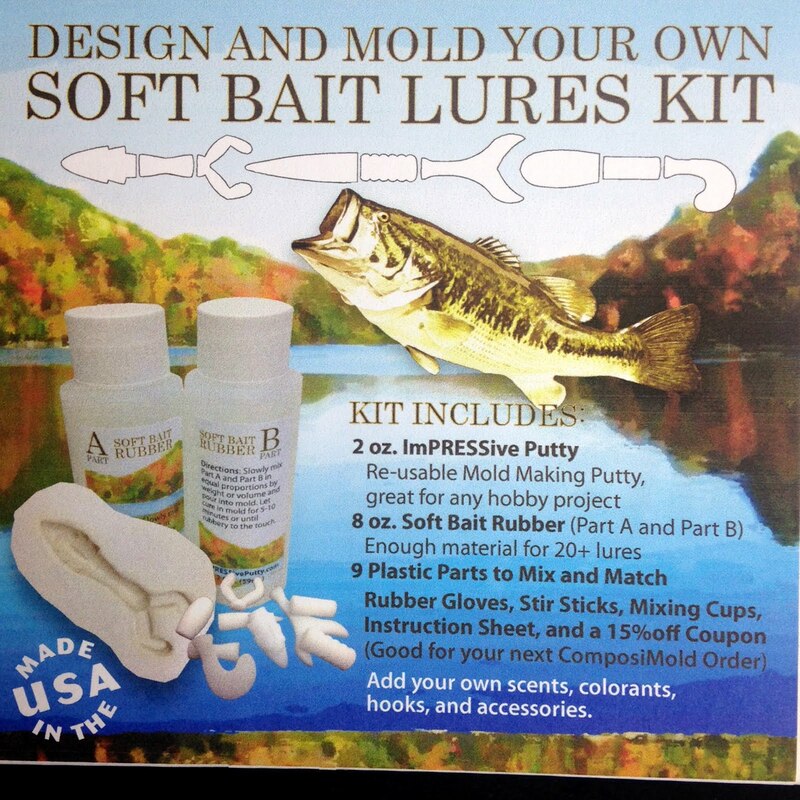 ECO-FRIENDLY SOFT BAIT LURE KIT. EcoLureMaker lets you make the lure to catch the big fish using Biodegradable Fishing Lures that You Make Yourself. You make the lures using the Biodegradable rubber that last for approximately an hour in most water conditions and acts as a fish food, so not only will the fish love it, they will eat it. Sign up for our newsletter and you'll receive a first order discount! Why Customize your Own Soft Bait Lures? When you haul in that big fat fish, and you're friend asks what you used, you can tell them you made your own lure. You know the waters and you know the fish. 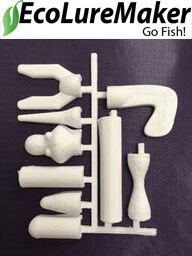 And with your own fishing lure making kit, you can make your own soft bait lures anytime. Much like fly tying, the ability make your own soft bait lures lets you make the lures the way you want. The EcoLureMaker Soft Bait Lure Kit comes with basic shapes that can be mixed and matched to make over 50 different shapes, but you can also use the same molding process and materials to make any other shape. You are in charge of making the lure, because you know what the fish need. You are in control of adding extra fillers, colors, designs, and more. You make the lure to catch the big one. 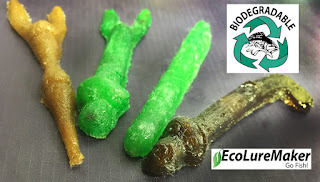 Biodegradable fishing lures won't hurt the fish. It's digestable by the fish and will disolve in water over time. As an added bonus, the fish are attracted to the disolved lure making it even easier to catch that big fish. For so many years we've been leaving unsafe rubber lures in the water. 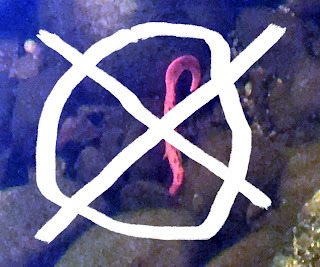 The rubber cannot be digested and stays in the stomach, slowly killing the fish. Plasticol soft bait lures are made from PVC with huge amounts of plasticizers. Although in recent years, the cancer-causing plasticizers have been reduced or eliminated, the rubber is still there and does not break down in any natural environment. Fish, such as trout, and even bass and catfish, eat the lures, but they cannot be digested so they remain in the stomach. Also, when making your own soft bait lures, the plasticol is heated. During the heating process, potentially dangerous fumes are giving off that is unhealthy to you. The plasticol lures can be replaced with something better for you, better for the environment, and better for catching fish. It's the outdoors. It's your playground. It's what you love. Digestable by the fish, designed to attract the fish. Degrades in any water. It will last about an hour in most fishing conditions. Long enough to fish, short enough to leave the fish safe. Easy to make and use. Treat it just like live bait. Don't worry about losing a lure, it's safe for you and the enviroment.